We are providing good air..and good hairdo as well. A big supporter of professional people. The name of TWIST is derived from the twisting of cultures between countries, languages and races to recreate new air. Being in the industry since 2004 and setting up our base in Singapore since 2010. The chief hairstylist has worked in well-known salons in Singapore before opening his own salon in 2010. Nominated Top 5 Singapore of Color Zoom Goldwell and has worked with L’Oréal for their photoshoots. Nominated TOP 5 Sales in 2016. Hairstyles may seem to be all the same on one point. When there’s a trend, people tend to follow suit. But, even though everyone is sporting almost similar hairstyle, it is the way you carry it that makes it unique and make that hairstyle your own. Rather than trying hard to become exactly the same as the style you see, why not think of ways on how that hairstyle will best suit you? This is where your best hairdresser Tanjong Pagar enters the scene. When choosing the best Tanjong Pagar hair salon, what do you usually consider? Is it the ambiance of the place - do you like it when it is more comfortable or has a certain theme or feel to it? Or is it the name of the hairstylist you are more interested in? Do you want someone popular across town to style and cut your well-cared of locks? Or are you looking for value? Do you want high-quality hair treatments that come with competitive prices? What if, you can find all that you are looking for here, in one place? Here at Twist Salon. Your Tanjong Pagar hair salon will be your number one solution to all your hairstyle woes. From the state of your hair, shape of your face, and even your fashion style will be considered when getting your hair done. Doing this will make your hairstyle from the best hair stylist Tanjong Pagar perfect for you. Here at Twist Salon, we make sure to listen to what you, our customer, want and at the same time give you a suitable hairstyle that will make your overall appearance perfect. 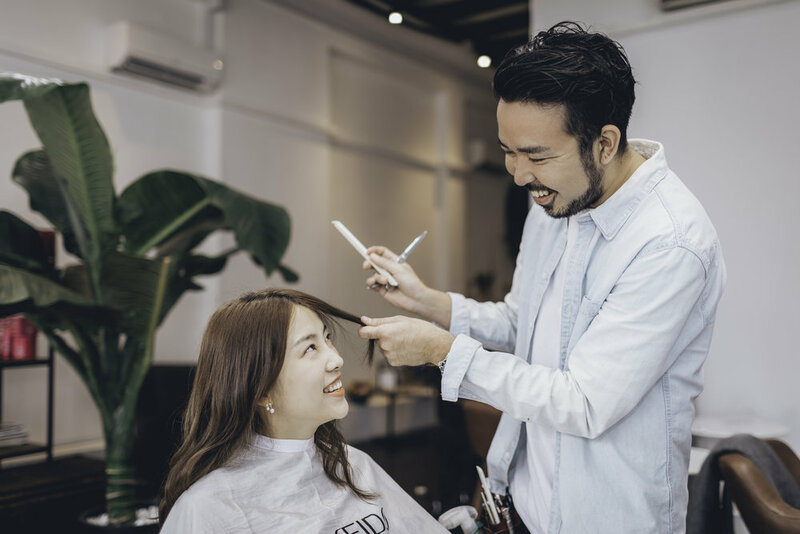 With your new look, with the help of our best Japanese hair stylist Singapore you can go wherever you want and look your best any time of the day. Listen to great music as you get your hair done by one of our Japanese hairdresser Singapore. Let us make you feel how it is to get styled in the best hair salon Tanjong Pagar. Twist Salon is a full-service Japanese salon Singapore that is dedicated in providing constant customer satisfaction by providing the best hair service Singapore using only the highest quality products, paired with enjoyable interiors and furnishing and acceptable price range. Moreover, we will make sure to maintain a fair, friendly, and creative environment and keep ideas, diversity and hard work respected. Our Mission: This Tanjong Pagar hair salon aims to supply products and services that will help enhance the client's’ physical appearance, improve their self-esteem and promote mental relaxation. Our number one priority is to give you the best hair cut Singapore! Our Vision: Our Vision is to make all trends start with us. Since we have the best hairdresser Tanjong Pagar, we know that we will be able to live up with our vision. We want our salon, The Twist Japanese Salon Singapore to be the name that you trust when it comes to hairstyling and hair care. We searched for months in order to get the perfect location, and we found one. We are now claiming to be the best hair salon Tanjong Pagar. Our ambition is to procure highly professional hairstylist Tanjong Pagar and establish a salon that has great potential, particularly in the field of Japanese hairstylist Singapore. Don’t Have a Hard Time Explaining! Almost every one of us had already experienced a hard time explaining what we want to do with our hair. Our hairdresser Tanjong Pagar will give you complete or comprehensive counseling before doing any method. With Twist Salon, we will not only consider your preferred style but also tell you if it will suit your face shape, face structure and the hair itself. Of course, will bring in the latest trends so you will have a great choice of what will be the best for you. After that thorough assessment, we’ll create your look, but that doesn’t end there. We can also help you with after-care support and teach you how to style your hair at home. As a salon with Japanese concept, we know that it is appropriate for our hairstylist Tanjong Pagar to use high-quality Japanese hairstyling products. Of course, we do not only consider beauty, but we also ensure the health and safety of our clients. Therefore, we only use tested products that are less likely to cause unwanted reactions. If possible, we want minimised amount of chemicals in our product so we carefully choose those with less or zero harmful ingredients. Tanjong Pagar hair salon that is focused in the art of hairstyling and with the help of our Japanese hairdresser Singapore, we aim to earn your trust, as our customer because you entrusted us with your hair. Our team of best Japanese hair stylist Singapore strives to set the newest trends and push boundaries in hairdressing. All of our Japanese hairstylist Singapore are trained by prestigious and highly-acclaimed stylist in order to offer the best hair service Singapore. They are trained under a comprehensive and modern training programme that ensures extensive knowledge in haircutting, colouring, and styling. We also partnered with premium brands that offer high quality tools, hairdressing equipment and hairstyling products so we can create the most striking Japanese hairstyles and best hair cut Singapore. Visit us now and choose from our wide variety of best hair cut Singapore, colouring, hairstyling, as well as rebonding, perming, and other hair care services.